When Makuta realized that his Rahi were not enough to defeat the Toa, he created a stronger agent of destruction. With his flaming sword, shoulder-mounted drill, and huge, sharp shoulder pads, Hawera is ready to do whatever it takes to prevent the Toa from overthrowing his dark lord. I never liked Tahu; he's just kinda lame. He's got absolutely nothing special to make him worth owning, yet he seems to be the Bionicle posterboy. He's the one shown on the commercials and it's his Hau mask that's held up typifying all the Kanohi. Bleh. Anyway, as such, I had zero interest in buying Tahu. However, holding true to its skewed world view, Lego didn't want its newest line to promote violence, so therefore the heroic Toa don't really have any enemies against whom to fight. Yes, they are often set upon by possessed animals, but in order to defeat them (and all their enemies) all that must be done is to knock off a mask. That'd be like if Mike Tyson was the world champion of removing other people's hats; just kinda ridiculous. In order to overcome this antagonistic shortchanging, I decided to create a bonefide villain for the Toa to fight. Over at the Mask of Destiny website, they pondered what would happen if Tahu accidentally donned one of Makuta's infected masks. Working from their basic design, I followed the instructions for Tahu, but gave him Onua's grey arms and legs, those massive claws as intimidating shoulder pads, and the sinister yellowy eyes from Lewa. And while I do have an Infected Hau mask, I decided that the copper Huna that TRU gave away looked more evil, and set him apart from the standard fire Toa - it wasn't just an accident that had turned him evil, this was by choice. Dismantling Whenua (for another project), I used some of his random pieces to give Hawera heel spurs and the moveable missile. 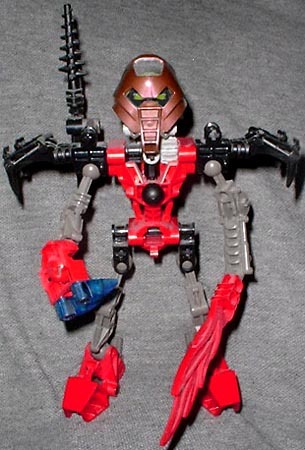 What's your favorite Bionicle baddie? Tell us on our message board, the Loafing Lounge.